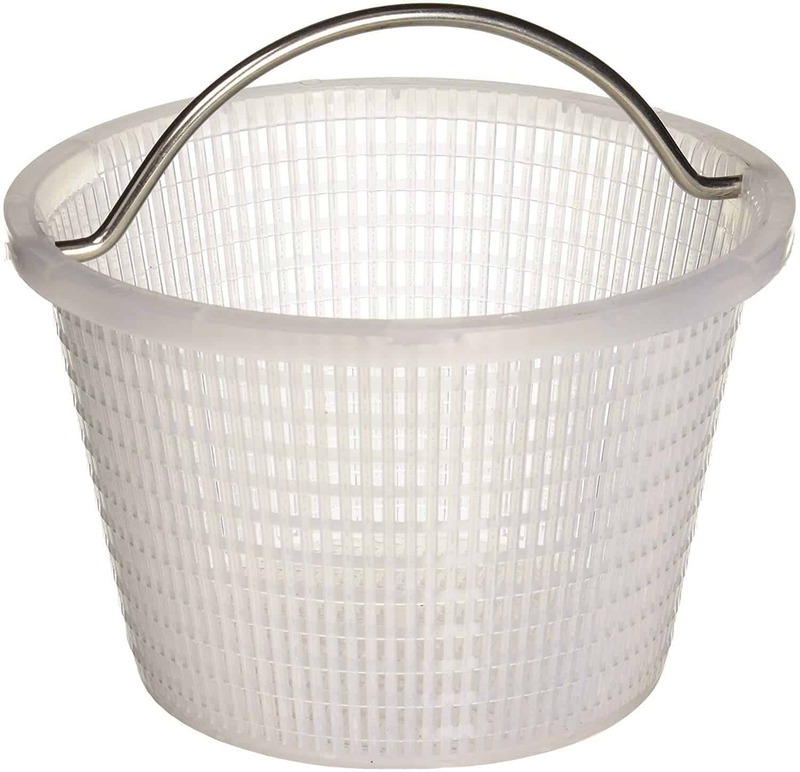 Pool skimmer baskets are one of the most interesting parts of your pool's built-in cleaning and filtering system. A skimmer basket collects and strains foreign materials on the surface of the pool that can harm your pool's filter and pump system. You will be surprised by the things that you might see inside your skimmer baskets when you clean them weekly. The skimmer basket system is composed of three main parts - the lid, the skimmer basket and the weir door. The lid is the primary access to the skimmer basket. It is located around the pool deck. It is usually made in plastic, but more people prefer using customized brass lids because plastic lids are prone to breakage. It is the main access to the skimmer basket for cleaning purposes. It also protects it from getting foreign material from outside the pool. The weir door allows debris that is floating on the pool's surface reaches the skimmer basket easily. It also ensures that the debris is kept inside the basket. The skimmer basket ultimately collects all the debris in the form of leaves, insects, small toys and more. ​Basket fits in skimmer perfectly and stays weighted down in the water. ​It can be considered a nice replacement fit. ​The plastic handle can be removed. ​The skimmer basket floats when it is used in pools with salt water in them. ​The handle can be flimsy if an excessive amount of force is applied to it. ​The skimmer basket is a lightweight and it could use some additional weight for it to be installed appropriately on the skimmers. 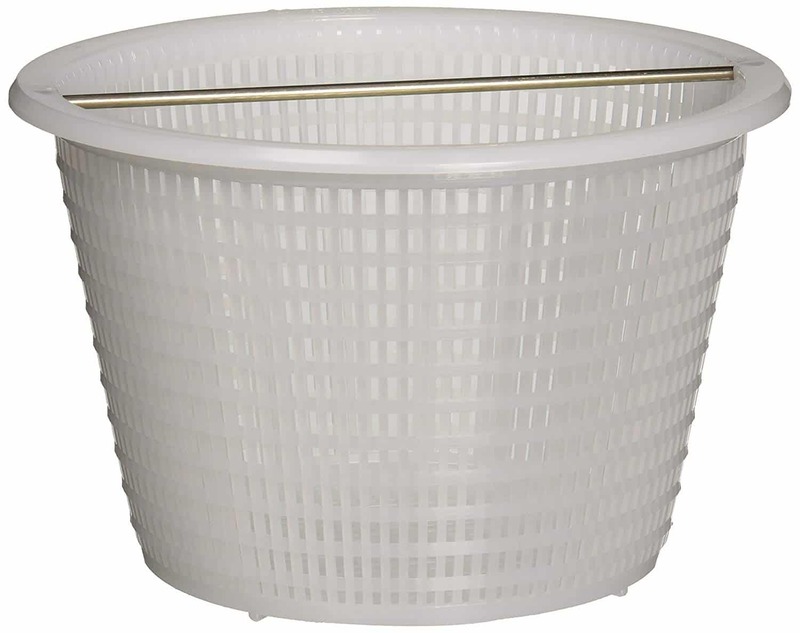 The Pool Ruler skimmer basket is made especially for specific pool fittings. However, this can be used either as a direct fitting or replacement. For its price, this product performs as what is expected from it. To lengthen its service life, you may need to take care of it by making sure that it is well fitted into the skimmer so it would not float away. Overall, the Pool Ruler Skimmer Basket is a good buy! The Pentair Vinyl Liner Skimmer fits Pentair Bermuda Gunite and vinyl liner skimmers. It has a handle basket as a replacement and it measures 5-1/2-inch length by 5-1/2-inch height by 8-1/2-inch width. ​The handle is made up of metal. ​The basket is bendable on its sides. ​The handle is sturdy and strong and does not pull off too easily. ​The curved bail design makes the basket easier to remove. ​The tip doesn't catch all the way around and can slowly get forced down in the skimmer well. ​The basket could break if extra pressure is added to it. The Pentair Basket skimmer is specifically designed for Pentair fittings and it sits well. It has a curved ball design which makes it easier for you to remove and drain it every now and then. The metal handle also adds the sturdiness of the skimmer basket and ensures the user that it's going to be sturdy enough to handle some kind of pressure. ​The durability of this pool skimmer basket is excellent. ​It works best with in-ground swimming pools. ​The plastic is strong and sturdy enough to withstand any amount of pressure. ​You would not need to reach into the skimmer to life out the basket. ​It allows water to flow to the pump even if there is debris filling up the basket. ​The handle comes with a small weight. ​The skimmer basket may break with added suction pressure. ​The handle can pop off from the top part. Putting aside the issues with the basket's handle, this is actually a great skimmer pool basket. If you're one of those people who doesn't like their hands to touch the foreign materials strained by the skimmer, then you should get the GVT Skim Pro. It also provides continuous water flow even if the skimmer is filled with debris so you won't have to worry about forgetting to drain it every now and then. The Hayward basket replacement for automatic skimmers fits perfectly with any Hayward skimmer models. It supports the sp10712s, sp1071210fva, sp1070, and sp1071 models and it weighs about 6 pounds. The filter is an inverted trapezoid and it can be removed every now and then. ​It is sturdy enough to withstand a certain amount of suction pressure. ​It fits perfectly and designed for Hayward Automatic Skimmers. ​The basket's handle can be removed. ​The skimmer pool basket can deteriorate quickly from the chlorine. ​The openings of the basket allow small leaf debris to pass through it. ​It could clog if not drained out frequently. 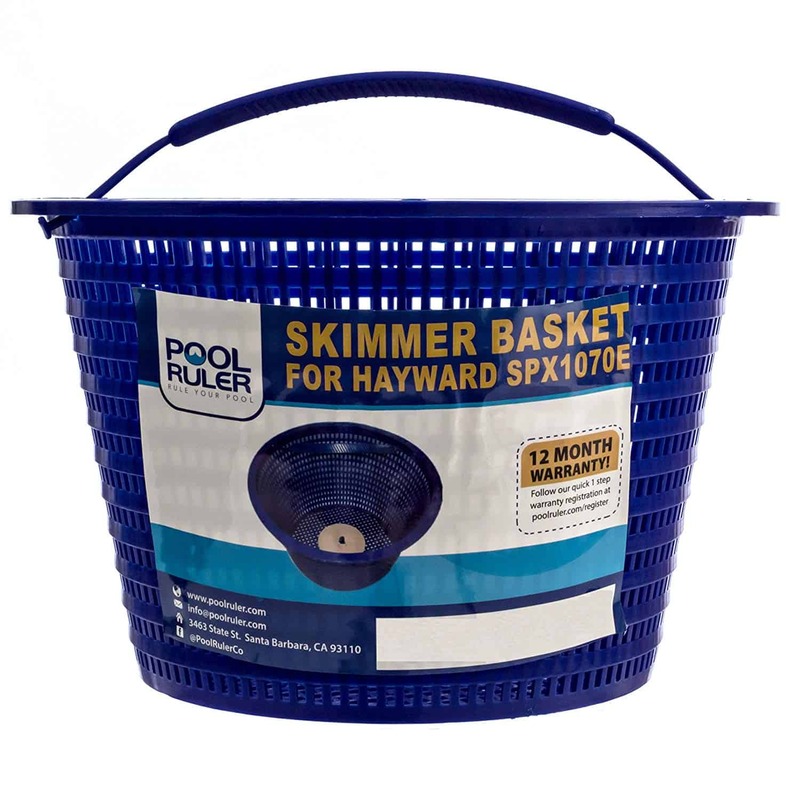 The Hayward pool basket replacement skimmer is perfect for any Hayward automatic skimmers. The filter is an inverted trapezoid which you can easily remove from the basket set-up to filter out the debris. You have to keep in mind that with this product, you have to drain it out to prevent clogging. Aside from that, this product performs very well and could meet, even exceed your expectations. The Hayward assembly replacement is specifically made for Hayward SP1082, SP1083, SP1084, SP1085, and SP1086 Series Skimmers. Its dimensions are 7 inches wide at the top lip and 5 inches deep. ​The debris comes off easily when drained. ​Properly and effectively screens out the debris. ​It can be easily removed from the pool skimmers. ​The handle may be flimsy and can snap easily. ​The basket weighs lighter than the usual. The Hayward basket assembly replacement is perfectly designed for select series of Hayward Automatic Skimmers. It effectively screens out the debris collected from the basket skimmers. You can also easily remove the basket from the skimmers to drain it until it's empty. Although this may need added weight for it not to be dislodged from the skimmers, it can actually stay in place until much effort is exerted onto it. The Hayward basket assembly replacement is perfect for any Hayward automatic pool skimmers. 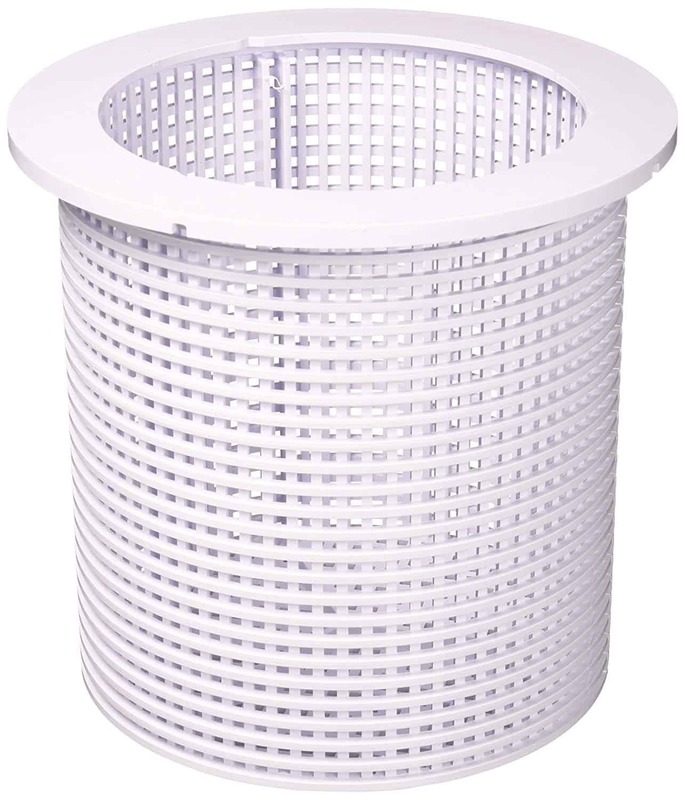 The Pentair Replacement Admiral Skimmer Basket is a genuine replacement for any Pentair pool skimmers. This can be used for admiral skimmers that use a floating weir. It measures 8-7/16" in diameter and 7-3/4" in height. This can very much fit into American Products 850001-S-10 And Aladdin B-37 skimmers. ​The material of this pool skimmer basket is injection molded. ​Fits perfectly to any Pentair pool skimmers. ​The basket is durable and sturdy. ​You may need to exert extra pressure to get the basket out of the skimmer. ​The underside lip that's used to stop the debris from falling out can make it tricky for you to remove and drain the basket out. Aside from its design constrictions, the Pentair Admiral is actually a pretty reliable skimmer basket replacement. The materials that are injection-molded clearly adds durability and strength to this, even possibly extending its rated service life. However, because of its added strength, you can have a bit of trouble removing this to drain it out. The Pentair skimmer basket is specifically designed for genuine Pentair pool skimmers. It comes with a weighted metal rod handle for easy removal and draining. ​It works best for in-ground swimming pool skimmers. 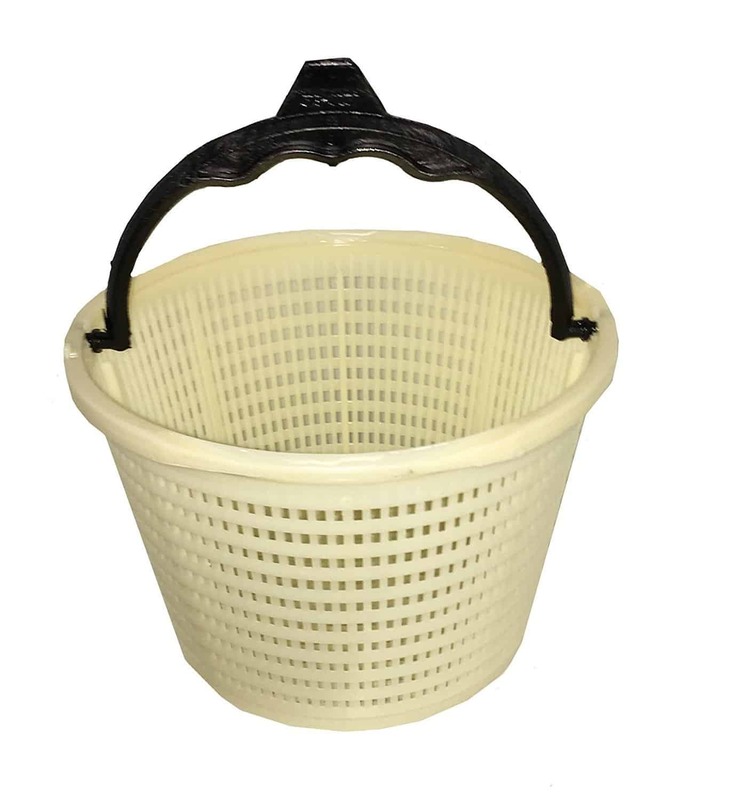 ​This comes with a handle which you can easily grasp when taking the basket out of the skimmer. ​The plastic material can be a little bit flimsy and can break when taken out of the pool skimmer. ​It is made from lightweight material so it can float when it is not weighed down. The Pentair Sta-Rite swimming pool skimmer basket is marketed for Pentair products. Its designed to have a handle which you can use to aid you in taking out of the pool skimmers. However, you might need to put extra caution when you are removing it as the basket is made of lightweight plastic and could break with additional exerted force. 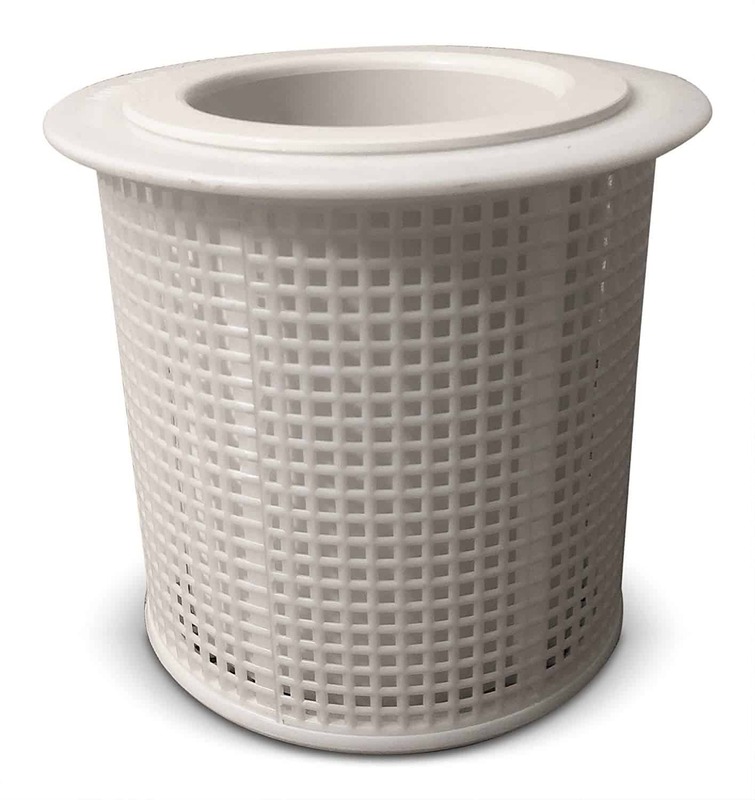 The generic Hayward skimmer basket measures 7 1/8" for its top diameter, 6 5/8" for its bottom diameter and its height is 5". This can fit perfectly into any Hayward B-152 pool skimmer and can effectively strain the unwanted material from floating around your pool. It also comes with a handle which you can use in getting it out the skimmers to drain the leaves out. ​It fits just right to any Hayward swimming pool skimmers. ​You have the option to remove the handle if it gets in the way. ​It is made from sturdy material. ​The handle can be a little flimsy and can break easily. Apart from the issues with the handle, the Hayward B-152 skimmer basket is actually good. It does the job of screening out unwanted materials from clogging the pool's filter and you can easily take it out to drain it every now and then. The Aqualine skimmer basket works well with American Products 850001-S-10 and Aladdin B-37 Skimmers. The height of this skimmer basket measures 7 3/4", bottom 7 1/4", and the top lip overall measure 8 1/2". It is made from high-quality, lasting durable plastics which can guarantee you that it could last for quite some time. The manufacturer also provided this product with a 30 Day Money-Back Guarantee and offers up to one year of service warranty. ​It is designed perfectly to fit with American Products 850001-S-10 and Aladdin B-37 Skimmers. ​A weir can be attached on the lid for it to float to catch the bugs and leaves. ​It is made of sturdy and durable materials. ​It is covered with a 30-day money back guarantee and a one-year warranty. ​This is not equipped with a handle. The Aqualine skimmer basket is really a perfect fit for American Products 850001-S-10 and Aladdin B-37 Skimmers. Although this product is not designed to come with a handle on top to help you get it out of the skimmer, it can still be easily removed out and tucked back in. We love that this has a one-year warranty so if anything goes wrong, you are sure that you can get in touch with the manufacturer to help you fix the product. 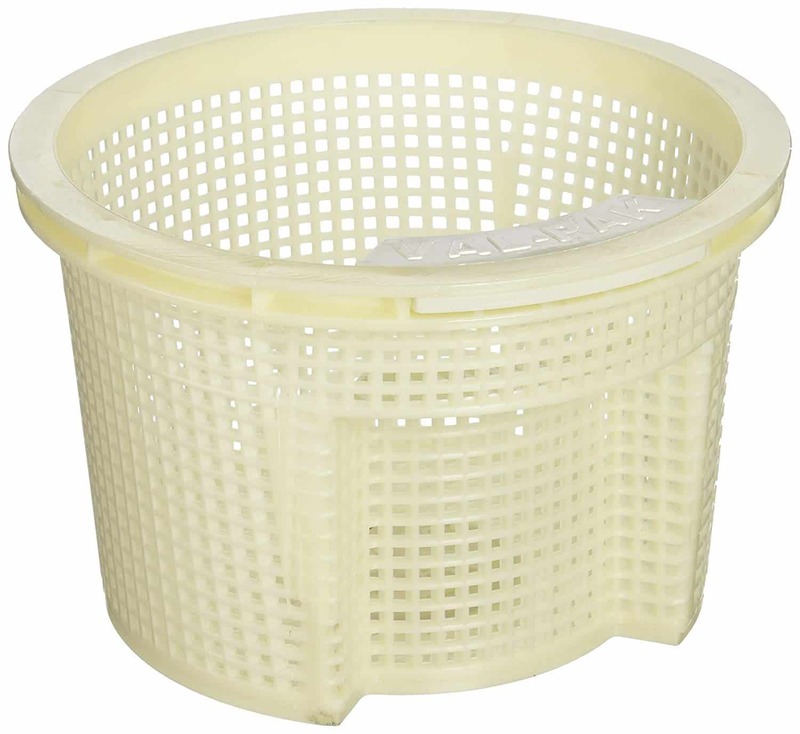 The Custom Molded product vented handle flowskim skimmer basket is easy to use and it is weighted at the bottom so that the basket could not float away. It has a vented handle which will make it easier for you to remove it every now and then from the pool's skimmers. It is also made of high-quality heavy plastic which assures you its durability and strength over the course of use. ​The skimmer basket is made from high-quality material. ​It is durable and can withstand a certain amount of stresses. ​The vented handle helps in the easy removal and installation of the basket. ​Spiders that are initially trapped in the basket can live for quite some time and could get out into the pool once again. 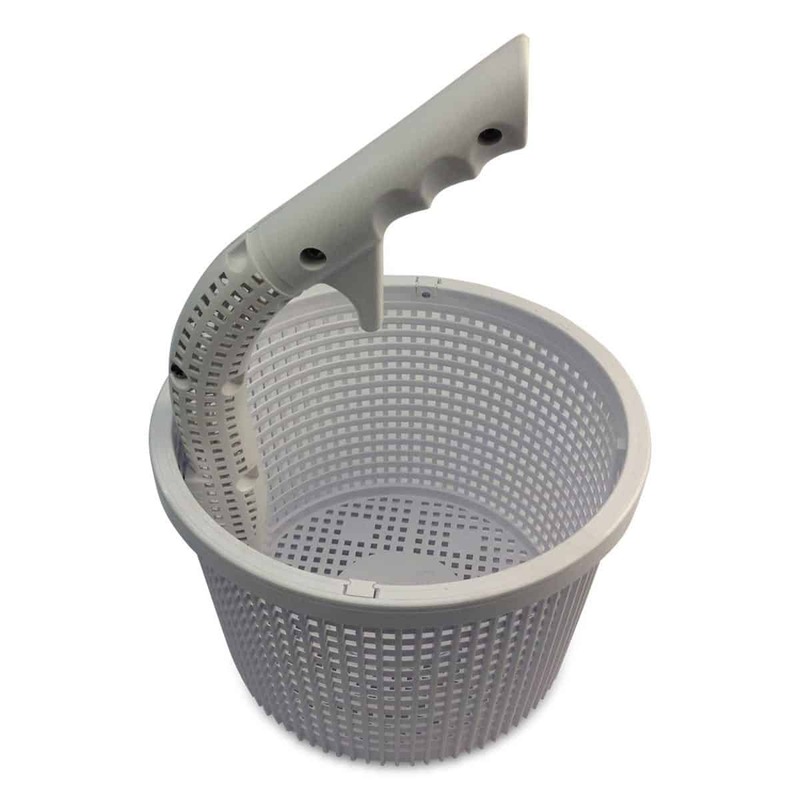 Custom Molded Products' vented handle skimmer basket has been incorporated with a unique handle to help you to easily clean the basket once it is full. The half-vented handle design allows you to put not much stress on the handle compared to those whole metal handles and can lengthen the service life of your skimmer basket. The Waterway Swimming Pool Skimmer Basket fits the Waterway Renegade Gunite Skimmer and Waterway Renegade Vinyl Liner Skimmer. The top's outside diameter measures 8 inches, the height is 5 1/4" and the bottom diameter is 5 3/4". 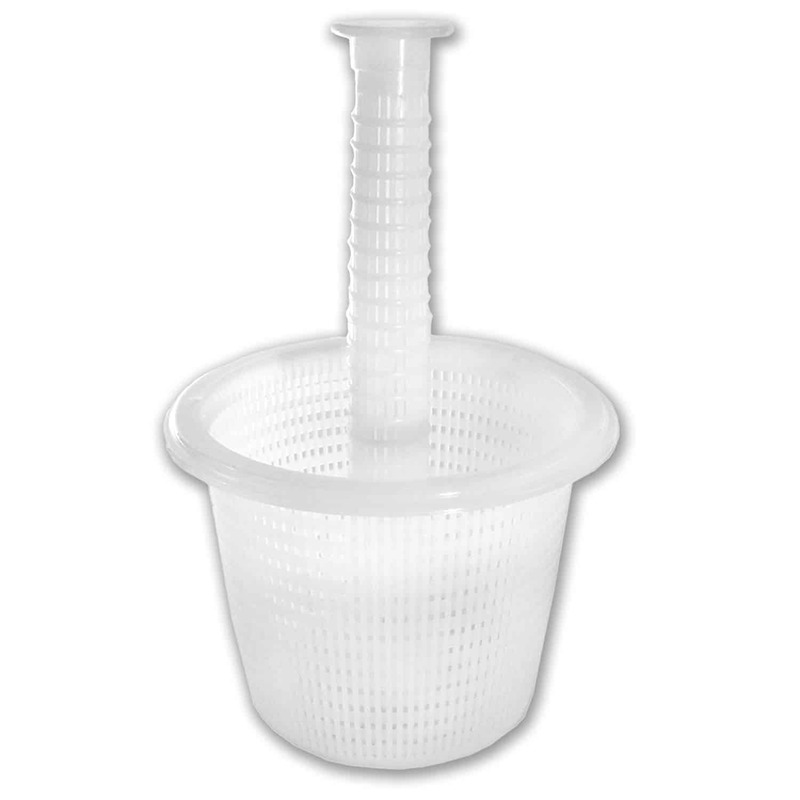 The skimmer basket comes with a plastic handle which can aid you in getting the basket in and out of the skimmer. ​The design includes a handle which can be used when draining out the skimmer basket. ​Works best with in-ground swimming pools. ​The basket is sturdy and the handle is firmly locked into place. ​It does not have a weight in the bottom so this can float away when it is not installed properly. ​The material for the basket itself is thin. ​May not work with some above-ground pools. ​It may not fit in some waterway skimmers properly. 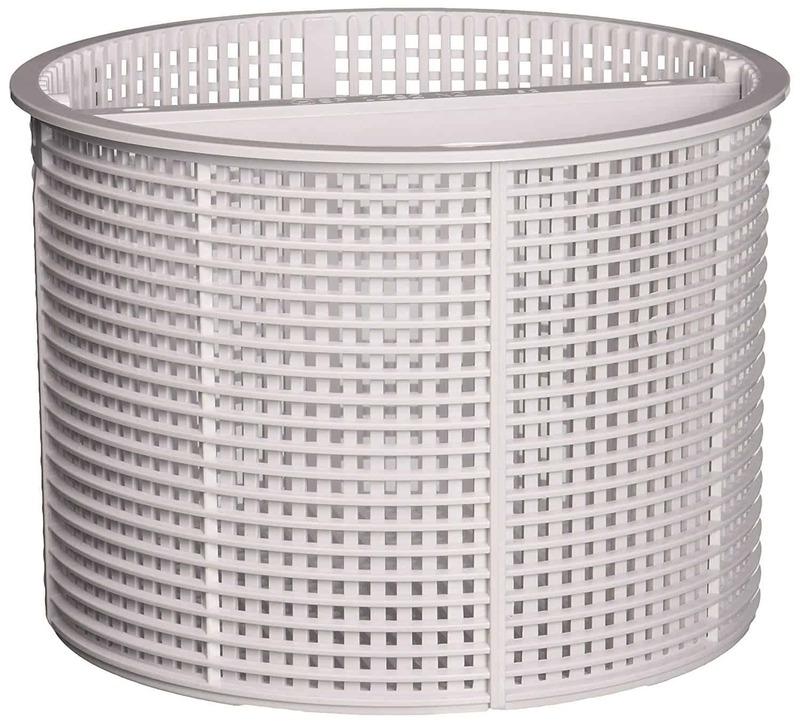 The Waterway Swimming Pool Skimmer Basket is designed for Waterway Renegade skimmers. You can easily place and remove the basket in the skimmers with the help of its built-in handles. Although you have to check the dimensions needed for above-ground pools, it is sure that this product can fit perfectly for in-ground pools. The basket is sturdy enough to stand applied pressure and the handle does not come off easily so it won't be a problem when you are taking the basket off the skimmers. 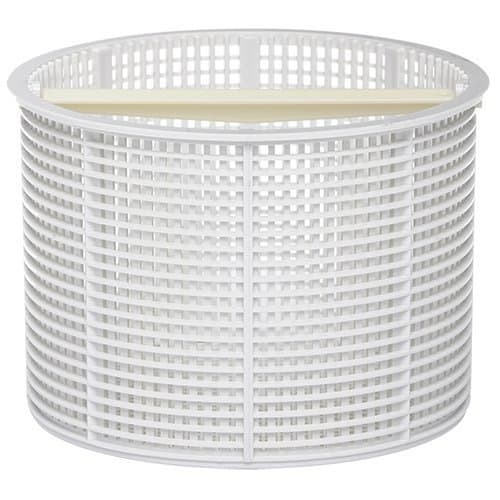 This skimmer basket by Val-Pak is classified as a U-3 skimmer basket (B-9). It is guaranteed to be manufactured to the highest standards to provide you with a quality product. It measures 8 1/2" across the top from one side of the lip to the other and 5 1/2" from the top of the lip to the bottom of the centered weight on the bottom. ​It is very durable and strong. ​The top part is designed to have extra additional space, in which you can securely tuck in pool skimmer socks. ​The basket is weighed down. ​The handle is on the side, compared to other skimmer baskets, which can be hard to use when dislodging the basket from the pool. However, this particular model does not have a horizontal rod across the top as the old models do, but its side handles can do the job as efficiently as it would have been. The basket also comes with an added weight on the center to stabilize the whole set-up when it is being used. There is no doubt that you need pool skimmer baskets in your pool. In fact, some pools have 1 to 5 sets installed on it. Pool skimmer baskets are inexpensive ways in which you can easily prevent you from spending thousands in fixing your pool's pump system. With the right dimensions, you can pick which skimmer baskets suit your pool the best.